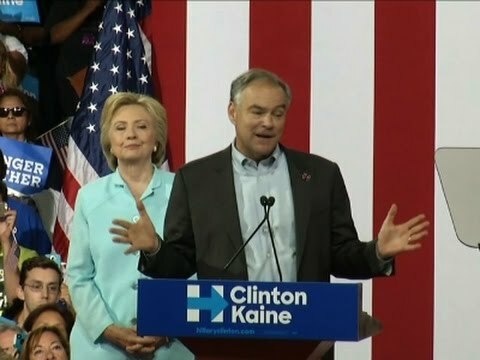 MIAMI — Hillary Clinton introduced running mate Tim Kaine as "a progressive who likes to get things done," joining the Virginia senator in the crucial battleground state of Florida to help kick off next week's Democratic National Convention. Clinton said Kaine cares more about making a difference than making headlines, and is "everything that Donald Trump and Mike Pence are not." "I like to fight for right," Kaine said, detailing his life in public service. Speaking at times in Spanish, he drew comparisons between the Democratic ticket and Trump. "Isn't it great already," he said of America. The senator is viewed skeptically by some liberals in the Democratic Party, who dislike his support of free trade and Wall Street. Shortly after Friday's announcement, Stephanie Taylor of the Progressive Change Campaign Committee said Kaine's support for the Trans-Pacific Partnership trade pact gives Republicans "a new opening to attack Democrats on this economic populist issue." Associated Press writers Alan Suderman in Richmond, Virginia, and Julie Pace and Lisa Lerer in Washington, contributed to this report.